Valve outline is broadly clavate and lanceolate, with a broadly rounded headpole and narrower footpole. The striae are weakly radiate and uniseriate, becoming more radiate at the footpole. The axial area is broad. A stigma is located in the central area. The raphe is straight and lateral, with external proximal raphe ends dilated and bending slightly. 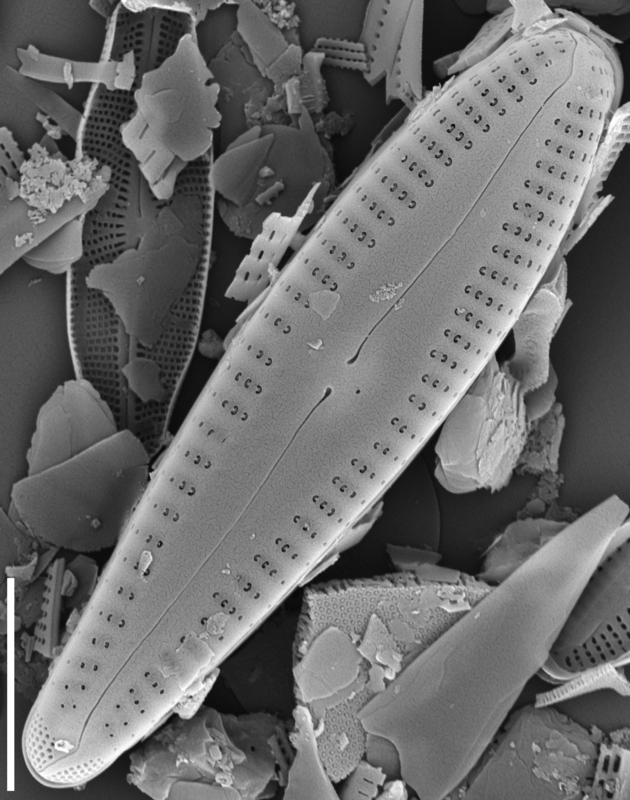 In the SEM, the striae are composed of distinctive C-shaped areolae. 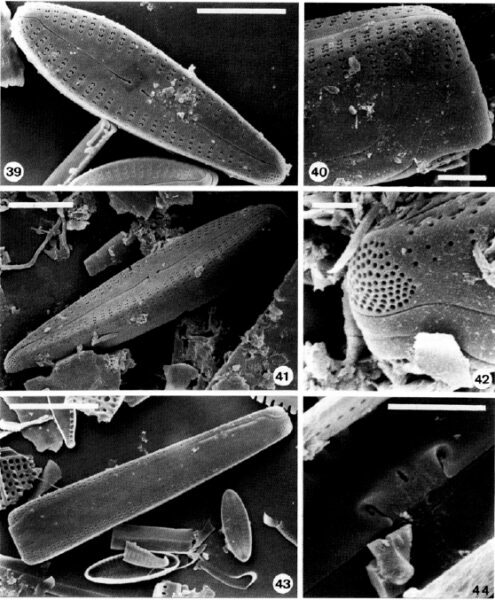 A number of species of Gomphonema with a broad axial area are found in eastern and southeastern rivers. 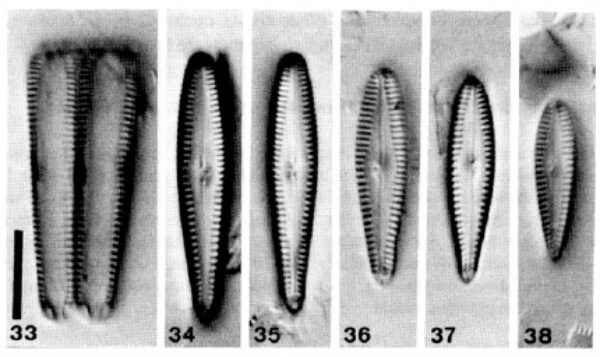 In past surveys, this taxon has likely been confused with G. entolejum Lange-Bertalot (as shown in Lange-Bertalot and Krammer 1987, Pl. 40, Figs 18-19) and G. clevei (as shown in Hustedt 1937-1939, Pl. 27, Figs 15-18). 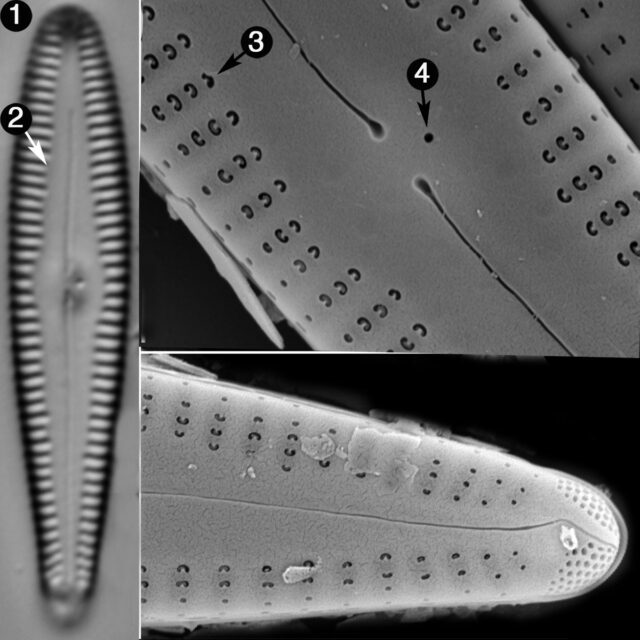 Gomphonema incognitum has C-shaped areolae (visible in SEM), which are not found in G. entolejum or G. clevei. Gomphonema incognitum was described from eastern Nepal, so it has an unexpected disjoint distribution in rivers of the southeast U.S. 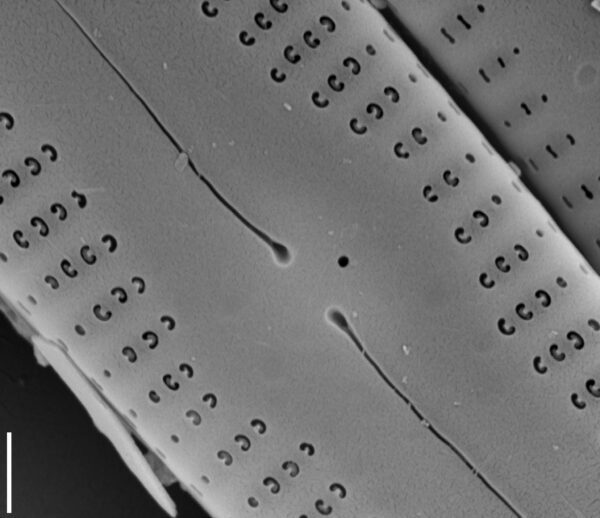 It has been verified in samples from Georgia, North Carolina and Alabama. All of the sites where it occurs the southeast are low in nutrients and considered least-impacted sites. Valvae late clavatae-lancolatae verticibus obtuse rotundatis, polis basalibus aliquantum minus late rotundatis. Longitudo 17-39 mm, latitudo 4-6.5 mm. Raphe leniter lateralis, fissuris externis undulatis. Extrema centralia externa internaque aspectabilia, extrema interna in eadem partem declinata. Area universalis late rhombico-lanceolata, stigma solitaria prope nodulum centralem posita. Striae transapicales curtae modice radiate, sub polos magis radiatae, in media parte valvarum parallelae, 14-16 in 10 mm. Puncta striatum plerumque tenuissime vel indistincte discernanda. Frustula aspectu cincturae paulo cuneiformia. Puncta vel alterae structurae in limbis vacant. Lange-Bertalot, H. and Krammer, K. (1987) Bacillariaceae Epithemiaceae Surirellaceae. Neue und wenig bekannte Taxa, neae Kombinationen und Synonyme sowie Bemerkungen und Erganzungen zu den Naviculaceae. Bibliotheca Diatomologica 15:289 pp. 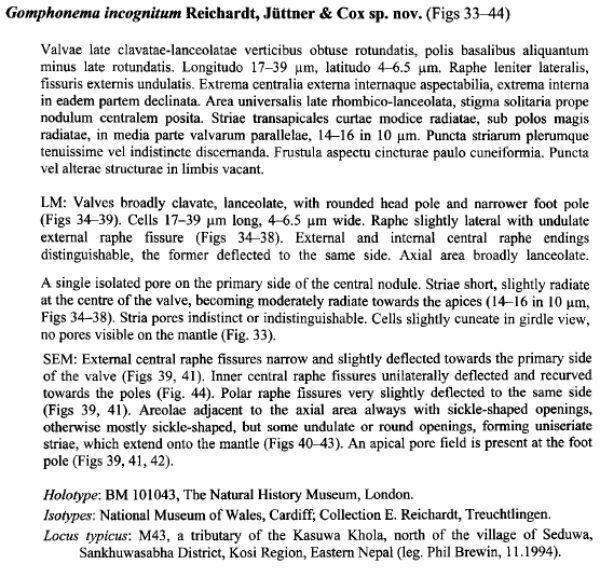 Valve outline is broadly clavate, with a rounded headpole. The striae are weakly radiate and uniseriate, becoming more radiate at the footpole. The axial area is broadly lanceolate. A stigmoid is located in the central area.